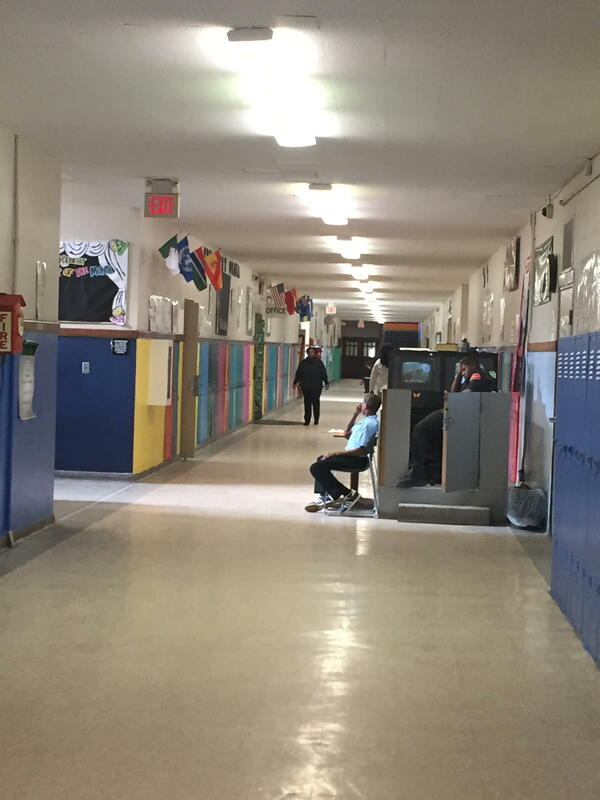 Since 2000, the city has seen nearly 200 school buildings shuttered. So, what happens to a neighborhood — and the kids who live there — when a school closes? Join us as we try to answer that question in We Live Here, a documentary about the history and future of neighborhood schools in Detroit. 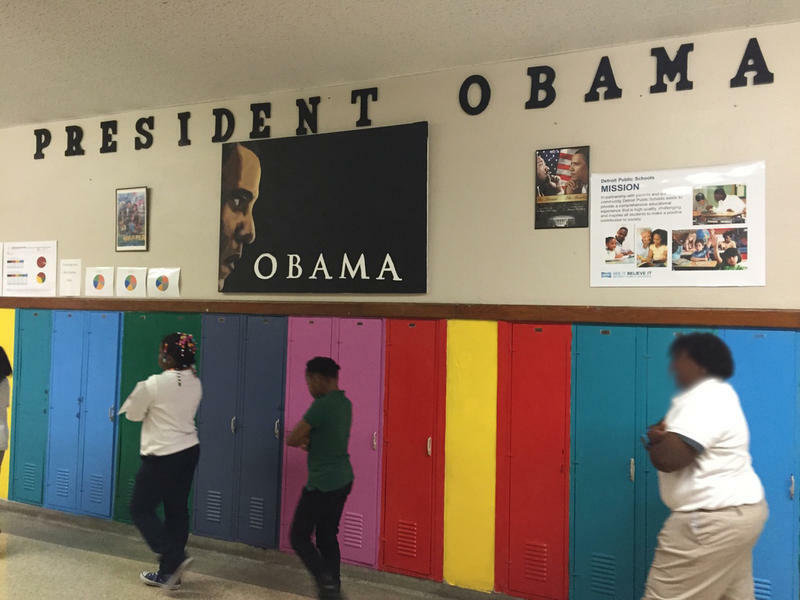 So, why did Detroit Public Schools end up shutting down 195 schools in less than 15 years? A large part of it had to do with No Child Left Behind, the federal education policy that pushed school closure as a means to raise student achievement. The law went into effect in 2002 and every year since, more than 1,000 schools across the country have been shuttered. A couple of years saw closures as high as 2,100 schools. Chastity Pratt-Dawsey is a reporter with Bridge Magazine. Back when the school closure crisis was ramping up, she was working for the Detroit Free Press. And she watched as school after school closed its doors. "I grew up in Detroit, and the school was the community center, you went there after school for community meetings, of course your parents vote there. Especially the high schools, right? The high schools are the center of your neighborhood," Dawsey says. "And now people say, 'Where’d you go to high school?' And you’re talking about a school that no longer exists. I went to Cooley, doesn’t exist. Murray Wright, doesn’t exist. Chadsey, what? Not there.... So, it destabilizes the neighborhoods." And every time schools closed, students got shuffled around in what some described as a city-sized game of musical chairs. The Littlefield neighborhood on Detroit’s west side is pretty quiet. There are a lot of vacant houses – some boarded up, some completely gutted by scrappers. The Detroit Land Bank Authority owns more property than residents do. Despite that grim picture, people do live there. Many of them are families with kids, a majority of whom go to Noble Elementary-Middle School. Noble was built in 1921, when the city of Detroit was booming. The population was growing like crazy, and schools were popping up all over the city. These were true neighborhood schools, built right in the middle of the neighborhood so kids could easily walk there. Noble Elementary-Middle School is one of 186 schools identified by the state as "priority schools." 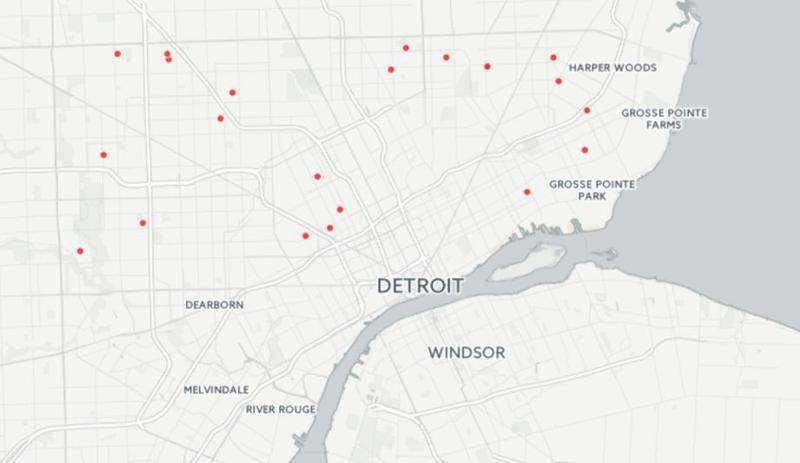 Noble was built to hold more than 1,000 kids, according to Loveland Technologies, a firm that tracks blighted properties in Detroit. But there are only about 600 kids there now. "It's friendly, it's like home," said 13-year-old Takiera Williams. She and her twin sister have been going to Noble since fourth grade. And many of the kids feel the same way about Noble. They have positive things to say about everything from their principal, to the benefits of having a school in their neighborhood, to the school itself. But here’s the catch: Noble is considered a failing school. Michigan’s Department of Education calls the the lowest-achieving schools in the state “priority” schools, and Noble has had the dubious distinction of ending up on the state’s “priority list” not once, but twice. The non-profit Excellent Schools Detroit gives out grades to all the schools in the city every year. Last year, Noble got an F.
Noble’s principal, LaToyia Webb-Harris, doesn’t sugarcoat how poorly the kids are doing on their assessment tests. "Some people in the state of Michigan think they should close Noble because we’re not doing well on our MAP or M-STEP. They don’t think the teachers are teaching because our blue bars aren't over the orange diamonds," she told students at a school-wide assembly. The blue bars show how well the kids did on a state test and the orange diamonds is where the kids should’ve have scored. "And in January they’ll release a list of schools whose blue bars are not over those diamonds and they might want to close Noble. If that happens, what school will we go to?" Webb-Harris asked. Six other schools share the same ZIP code as Noble. One is a traditional public school, the other five are charters. Here’s how Excellent Schools Detroit graded them: D+, D, D, D+, C, D. That's the educational landscape around Noble. Webb-Harris has been with the district her entire career. She started out as a special education teacher, and came to Noble three years ago. This is her second year as principal. She was born and raised in Detroit and went to Cass Tech – one of the city’s premier high schools. She lives in the suburbs and sends her own kids to school there, but she’s never wanted to work in the suburbs. "It was not a second thought, I was going to Detroit Public Schools. This is where my heart is," Webb-Harris said. "It’s personal to me. I needed to be with the children of Detroit." Webb-Harris did not create a failing school, but she inherited one. She’s trying her best to improve it, but how much longer she’ll have to do that is unclear. 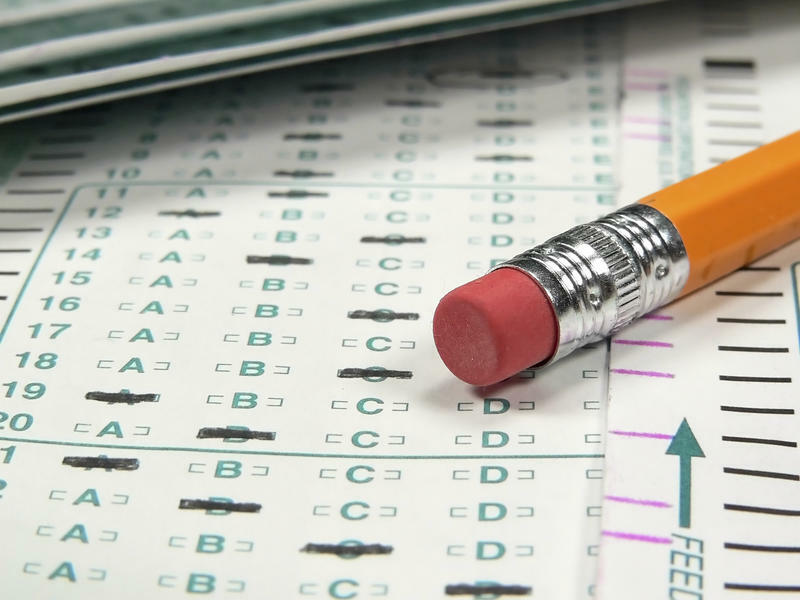 "Now we’re kind of in limbo, waiting to see if our scores have increased, but we have nowhere to go but up because we were looking at zero percent proficient, based on our M-STEP results," she said. M-STEP is the new state assessment. It was rolled out two years ago and by all accounts, it’s much harder than the old test. "And so now we have doubled to two percent and, you know, we’re moving ... inching up. But like I said, if you’re already at the bottom, you have no other way to go but up, and that’s what we have been going is up," Webb-Harris said. Noble is considered a chronically failing school. Governor Rick Snyder put more than 100 schools like Noble on notice last year when he removed the state’s School Reform Office from the Department of Education – where he has very little control – and put it in a department that he runs. Basically saying: Hey, failing schools, I’ve got my eye on you and now I can do something about it. So when Webb-Harris says she’s in “limbo” waiting to find out what’s going to happen to Noble, that’s what she’s talking about. It's something even the local block club members are talking about it. Carol Pickens is one of the founders of the Littlefield Community Association. "So we’ll talk about that, because we have looked at this before. This is not anything that’s going to throw us. We have looked at the possibility of Noble closing and what it would do," Pickens said to residents in a block club meeting. "So if that school becomes empty, we look at how we can turn it into a multi-use building. But we’re not going to have a building sitting in our community, decaying, because we’re developing our community. We have our park." The park Pickens is talking about is adjacent to the school, right in the middle of the neighborhood. And like so many public parks around Detroit, this one had fallen on hard times. The playground was all rusted out, there was garbage everywhere. It wasn’t safe. That all changed in 2008 when Pickens, her sister Sandra, and a couple of others decided to bring the park back to life. The very park they used to play on as kids in the 1960s. "It had a little house where you could go in and check out your equipment – your basketball, your baseball ... and they had, you could play checkers, a sandbox," Pickens said. "We were always over here and you had the softball field, and we always had gloves and a baseball cap and a ball, always always, a game would break out at any time." Pickens moved out west in the 1980s and didn’t come back to Littlefield until 2000. When she did, she was devastated to see how far her neighborhood had fallen. The city of Detroit had it’s own crushing problems to deal with at the time, so the Pickens sisters knew their little park wasn’t going to be anybody’s priority at city hall. But they were adamant that the only way this neighborhood was going to survive and thrive is if there was a good school and a good, safe park for kids to play on. So they got to work. They applied for grants and drew up a site plan. They pitched it to the city and it was approved. They got money from the city and county to help bring their childhood park back to life. The play structure alone cost $50,000. They put in a walking path for seniors, a picnic shelter, and grills for families to use. Neighbors planted trees and kids helped pick up trash. They wanted people who live there to feel like they had a stake in the park. Carol Pickens at the park she helped revitalize in the Littlefield neighborhood. "We could have brought in an organization that could beautify the place years ago, but we understand if you don’t change the people’s heart, it’s going to revert back, and so our goal is that it stays, so you have to bring the people along with you," Pickens said. For the Pickens sisters, there is no line between the school and the neighborhood; they both need each other. A strong school and welcoming park are key to their grand plans for revitalization. It's worth noting that the Pickens sisters don’t even have school-aged kids. The way they see it, all the kids in the neighborhood are their kids. They’re in the process of buying one of the vacant houses across from Noble. They want to turn it into a "homework house," so kids can go there after school for tutoring. They’re not waiting for the city or some big philanthropic organization to swoop in and save their neighborhood. The residents are trying to bring it back on their own. One park at a time, one block club meeting at a time, one fixed-up house as a time. David Harris grew up in the neighborhood, right across from the park. And just like the Pickens sisters, he remembers playing there all the time in the 60s. He says he put a lot of love and care into his house. He also says he put that same kind of love and care into all the Detroit Public schools he used to work at – and he’s worked at a lot of schools in DPS. "I’ve worked at Winterhalter, Jamieson, and then my last school was Jemison, and I was at Wilkins, too, on the east side," Harris said. The school he talks about most fondly is Jamieson. He was principal there. He had student artwork up on the walls, he planted a garden there, and his teachers once threw a super fun Halloween party in the gym, which he still likes to talk about. "My school was like a Mecca of hope in that area, and when it closed it was like Vietnam after the war. It’s just devastating," Harris said. "I don’t even think any children live over there anymore, I think all the children have moved. Vacant houses, vacant lots, dilapidated buildings. It’s just a real sad situation." Jamieson closed in 2010, along with roughly 30 other schools in the district. There just weren’t enough kids there to justify keeping it open, plus the test scores weren’t great. So the students were shuttled over to Thirkell Elementary. At the time, it was a higher achieving school. But now it’s one of the worst in the state and is slated for possible closure. Bad news for the kids and bad news for the neighborhood they left behind. Harris is determined not to let that happen to Littlefield, although so many people have already left. The land bank owns more houses than anybody there. But the residents built that park and that park is everything. "That park is a stabilizing force in the neighborhood," Harris said. "We don’t have that, in our city, we don’t have that. You do not have that, that’s why I live there. People are asking me: why are you still living there? You could move anywhere! But I love that area, I love it, I love it." When a school closes, property values go down, crime often goes up, and families move out. Drive around some of those neighborhoods and you see a lot of emptiness. That's a fate Harris and others in the Littlefield neighborhood are hoping to avoid. How did Detroit end up with so many closed schools and emptied out neighborhoods? Find out in part two of our State of Opportunity documentary, We Live Here. And in the part three of our documentary, we ask the question: does closing a school actually help improve student outcomes? Poor kids in Michigan, and across the country, do worse in school than their wealthier peers. That’s particularly true for kids attending schools where most of the other students are also low-income, too. Schools that do manage to get kids in concentrated poverty performing on par with wealthier peers are the exception. This information is probably not all that surprising to you. But if you need a visual aid, take a look at where the bottom 5% of schools are in Michigan.